The next tech company to offer an Android tablet is Casio. The company, perhaps known more for its digital watches and its line of rugged G'zOne handsets, will be launching the Casio VX Tablet in the middle of this year. Tech site Recombu said that it had seen the tablet at the Retail Business Technology Expo, but the battery wasn't fully charged so they could not see the unit in action. 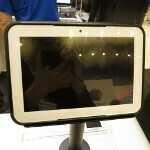 The tablet is equipped with a 10.1 inch display and should rollout with Android 4.0 installed. There will be a 5MP camera on back and a 2MP front-facing shooter and the Casio VX will have 16GB of native storage on board. There appears to be two different battery sizes for the device, 5000mAh and 7000mAh. The rugged case should help the unit survive the day to day dings and bumps that a tablet gets hit with every day. Pricing has yet to be determined but it will sell for more than the new Apple iPad, which starts at $499. In fact, Casio doesn't see this device competing with Apple's tablet or those made by Samsung, Motorola HTC or other consumer names. Guy Boxall, Senior Product Marketing Manager at Casio says that he sees the Casio VX as a POS device (Okay guys, you know we mean point of sale) that will help eliminate paper receipts as SMS messages are sent out instead. And when connected to a nFC enabled card reader, the Casio VX will support mobile payments via a NFC enabled smartphone. So while the public may never actually get a chance to purchase Casio's first Android tablet, if Casio markets this as planned, your smartphone might interact with it some day.